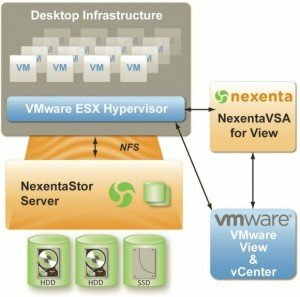 Storage for VDI: local or shared? In my interview with Sakthi Chandra (NexentaVSA for View Director), during the last Open Storage Summit EMEA, we have talk about the Nexenta approach of the storage for a VDI environment. 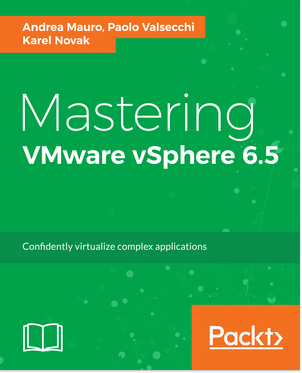 Their product has been developed from a collaboration with VMware and some aspects sound familiar: for example the overview of the VSA deployment and design seems similar to the VMware VSA, except the scalability limit (that is limited to max 3 host for the VMware solution). But I don’t want talk about the product, yet (I prefer dedicate it a post, when I will be able to make some test), but about the approach: using local storage instead of shared storage. 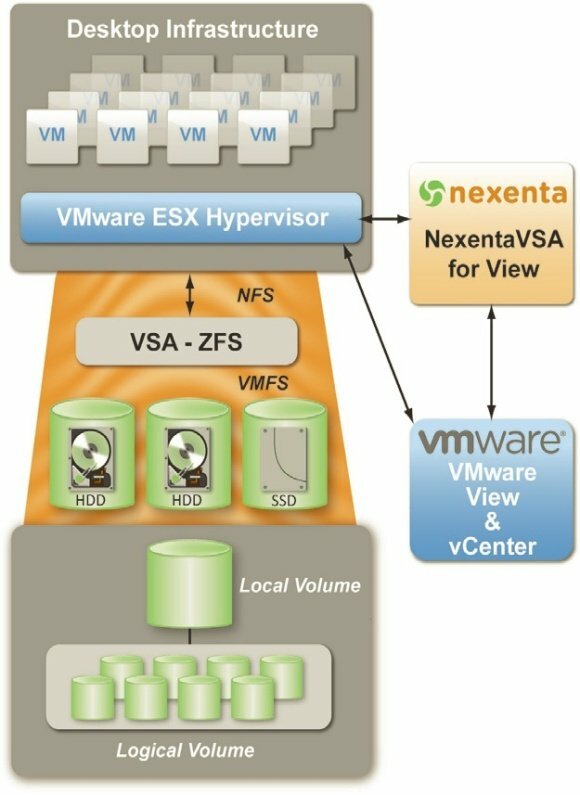 To be honest, Nexenta VSA for View could work with both approaches: or with local storage (on the left) or an external shared storage (on the right). If is clear the shared storage approach (the same as an usual server virtualization solution), the local approach could sound strange. But some clear advantages of the local approach is obvious: first it may be a cheaper solution, but of course this may depend. More interesting is that storage are local “near” the host processors and memory (that means less bottleneck), you can use specific solutions to accelerate the storage I/O (for example FusionIO or similar solutions) and the solution could scale more that a shared storage (to be honest this depends also by the shared storage type). In other way the local storage approach is an interesting example of a scale-out approach, where a single host become a “building block” of a VDI solution (with computational, storage and network capacity) and you can simple scale with more “blocks”. You can also benefit of new servers that are designed with a lot CPU power, a lot of memory (also more that 1TB) and also a lot of disks (in some cases also more than 20 in only 2U) and/or integration with specific solution to use flash/SSD. But of course, the local approach has several implication: what’s happen if an entire “block” fails? As a scale-out solution, you must design your application level to fail and handle the failure in the right way. Floating (non persistent) pool: where a desktop could be shared (in different time) with different users. Dedicated (persistent) pool: each desktop is dedicated and bounded with a specific user. Could be clear that floating pool could be “fail” in some way: if a virtual desktop is no more available (for example due to the “block” failure) a user has only to re-connect and could restart a new session on a new virtual desktop. What about his state? Using folder redirection or Persona Management you can save most of the state of the user profile. And what about the applications? You have to restart them (but also use a utility to track your application an automatically restore them). And what about the applications status? Some could partially handle it, for example Firewall could restore the tabs, Office applications could restore the open documents and try to fix them…. 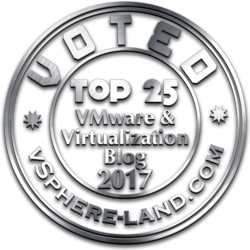 There is also a good post about this “dilemma”: Another battle royale: SAN vs. local storage for VDI. 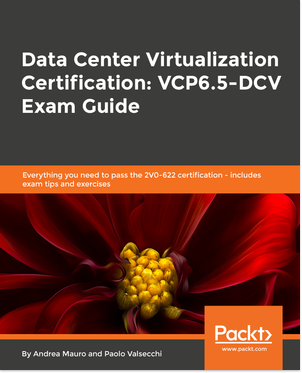 The considerations are quite similar… it depends on the VDI user-type and the case of usage. Note that similar consideration could be applied with local (client-side) vs. shared (datacenter side), for example when we consider the Local Mode in a View environment… which is better: Local Mode or using the virtual desktop from the datacenter? Of course Local Mode if I will be off-line, but when I’m connected and in the same network? Local Mode could have an interesting advantage: offload the workload and bring it to the client (of course this make not sense on thin or zero client). Another interesting point is the recent acquisition of VMware (VMware’s Wanova acquisition extends VDI to physical desktops): Wanova Inc.’s Mirage software is considered a low-cost alternative to virtual desktop infrastructure (VDI), but many customers use it along with VMware View. This could have some interesting evolution in the VDI world.